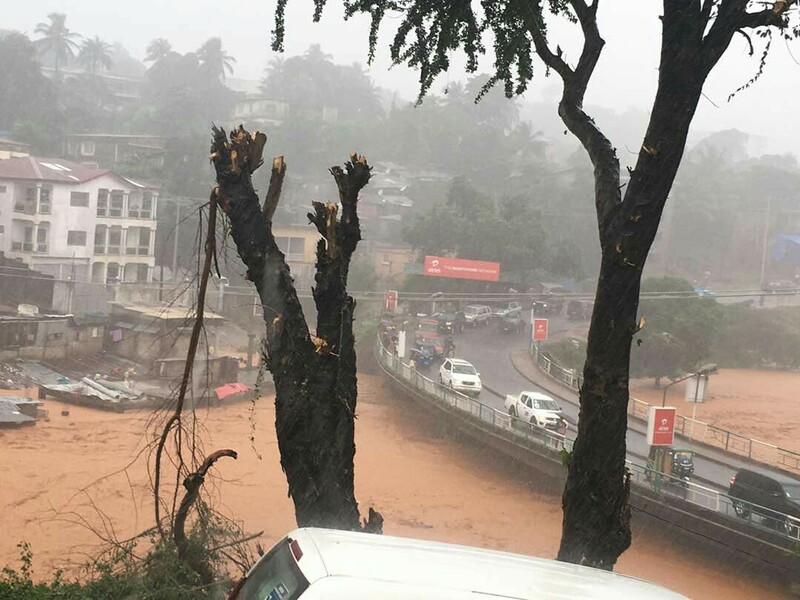 Heavy rains in Freetown have led to landslide in the vicinity of Guma in Regent and Mortema. Over 100 people are believed to have been confirmed dead at Regent land slide. There is unconfirmed heavy death toll in the Mortema area around the SS camp, Regent where more than 50 people are believed dead. Several houses are covered in deep mud with people stranded inside. Emergency services are trying hard to rescue people trapped in their homes, but with great difficulty. Also a road linking Regent village and Jui has been cut in two, with vehicle traffic now severely restricted. Other areas of Freetown that are seriously affected are: Kissy Brook and Dworzak Farm communities. More than 500 homes in the Babadorie and Kanigo communities are said to have been lost. The army has joined the police and survivors in helpimg to rescue people and recover the dead. SOS Alert – There has been a major landslide at Regent – near the GUMA reservoir area. According to eyewitness reports, a section of the hill has collapsed and several houses affected. Be exceptionally careful when driving to work this morning. It’s raining heavily and visibility is very poor, especially for those living up the hills. “This is absolutely terrible. Oh my God! Please let us pray that none of our brothers, sisters and children will lose their life in this very sad incident. Property can be replaced even though painful, as memory is lost. But life cannot be replaced. Lord have mercy on our people,” one pungent comment on social media. The Sierra Leone Telegraph will update you on this very serious and fast developing emergency in Freetown, as we get the latest information. God promised us not to destroy this earth with water, why then are our people dying with this kind of incidents? May the souls of those who lost their lives and the souls of all faithfully departed rest in perfect peace until we meet again. Prayers and Love from South Africa. May God Have Mercy On Mama Salone, As Most Of Our Brothers And Sisters Have Lost Their Lives In This Mud Slides. May Their Souls Rest In Peace. May Allah Have Mercy Upon them Amen! R I P.
R.I.P my Sierra Leonean brothers & sisters who died in the flood. May the almighty protect our lovely motherland. Rest in perfect peace my sisters, brothers, mothers,fathers and children. What is life. It is unpredictable, uncertain, what we expect and what we face. Let us remember that they that love beyond the world, can´t be separated. Death can´t kill what never dies. Nor can spirits ever be divided that which love and live in the same Divine Principle – the root and record of friendship. death is but crossing the world, as Friends to the seas; they leave one another still. I would like to say sorry to the departed souls and their families. May Allah bless their souls. Rest in peace. AMEN. It is not the heavy rain only that caused the landslide; the deforestation and rapid building of houses with no thought of drainage planning in the area around IMATT has caused this. May Allah help them all through these hard days. Amen.